Our Club's annual business advertising is a major source for fundraising for our Club and this year it is a direct way to help members reduce their registration fees for playing lacrosse here in Woodinville. Our two major expenses are field rentals and coaching and this program directly benefits members fees. In exchange for your generous sponsorship we will do our best to provide you with quality advertising to local families that are appreciative of your community involvement. 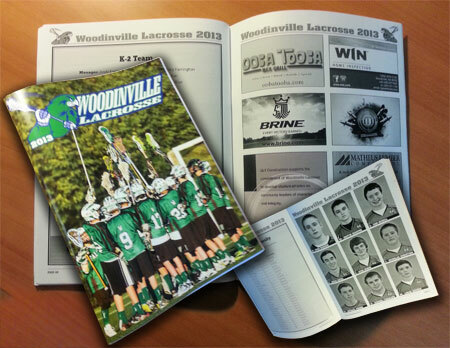 We will distribute free of charge, at a minimum 400 quality 8 ½” x 11” Woodinville Lacrosse Club Programs one for each club family and copies to be handed out at several of the 2014 Woodinville Lacrosse High School Varsity games. The audience for marketing your business extends throughout the Woodinville Community and the greater eastside with lacrosse teams and fans from Bellevue, Bothell, Issaquah, Kirkland, Mercer Island, Redmond, and Sammamish communities. All Club Program sponsors will also be listed on the Woodinville Lacrosse website Our Business Sponsor page with a link back to your website. Note: In addition to Cash Sponsorships - we will consider product & service donations for a club auction and/or raffles of equivalent value. Please contact Michelle to explore these options! If you would like to be a Woodinville Lacrosse Business Sponsor Chair.